What's in the box? 10+ years of romance! The following is a repost from Dustinfaber.com. For 11 years or so, I kept a secret from every woman I've ever dated, that I finally got to reveal to my bride the night before our wedding. A shoebox under the bed was the object I hid for so many years. This wasn't some crazy shoe box with a man's head inside of it, nor was it a pair of tennis shoes I was too lazy to remove from their rainbow-colored box. Far from it. No, this was a box filled with love. You see, 10+ years ago at Super Summer in Arkadelphia, Ark., when I was in high school, a woman told us of one of the most romantic things in the world. She said to get a box, write love letters, and give them to your future spouse. Well hot dog, that was right up my alley. I was crazy romantic in high school, almost to a fault of worshipping superficial signs of romantic attraction, but this sounded like a great idea. I loved to write, I loved love, and I loved my future spouse. Praying for her and writing to her were foreign concepts until that day. So I got busy writing letters, putting them in a shoebox that I decorated with different colored printer paper. I wrote the date down on the bottom of the box, and got busy. Some letters I wrote over the years were silly and sappy. Some of them, ones I dare not share online, were full of shame and remorse. Regardless of the mood, I poured my heart out in each letter, just like I was talking to my wife. And with each letter, I made sure to say a prayer for that mystery girl. This is just something I wanted to write to you about. My eyes are tearing up just thinking about you, and how wonderful you truly are. Everything about you is something I treasure. Your warmth and kindness, your ability to listen, your willingness to listen, oh I could go on and on but I'll stop. _____________, I plan to spend the best years of my life with you. For me, there is no escape hatch. When I say "I do," I mean it. Even now I dream about you. And in 20 years, that will remain the same. You are my everything. I thank God for us everyday. I love you. Ok, so not my best writing, but I like to think that nine years of practice makes me better. And I knew that no matter how cheesy my writing, my future wife would appreciate it. For the next 10 years, I did my best to write as much as I could. The frequency died down when I got into college and started living a lifestyle that God was not proud of. I just felt so ashamed of myself that I couldn't bring myself to face my wife, in the form of that box. 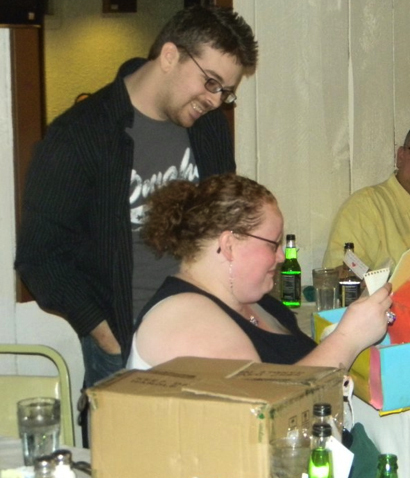 That pain eventually went away, and while I thought about destroying the box (thinking that it was useless since I couldn't keep my promise of abstaining sexually), common sense won out, and the rainbow-colored shoe box traveled with me everywhere I went. I never felt tempted to tell anyone I dated about that box, for fear that knowledge of my letters would ruin the surprise if that girl turned out to be the woman I married (I think I told maybe five people about that box). Eventually, I started dating Allicia, and when things got serious, I had my box with me. As the wedding got closer and closer, I kept thinking about the best way to present it to her. The rehearsal dinner? The honeymoon night? The Wedding itself? And what if she didn't even like the box? What if she just shrugged her shoulders and set it aside? What a letdown that would be! Eventually I decided on the wedding rehearsal. I wanted the night to be a special one, surrounded by friends and family. I also knew that this was crazy romantic, and wanted others to be inspired (and yes, deep down a small part of me wanted everyone to see how cool I was for coming up with this idea a decade ago). So as everyone got ready to eat, I stood up for big speech time. I can't remember exactly what was said, but I thanked everyone for coming, and told them that I didn't feel special enough for people to travel 1,000+ miles to see me for one weekend. I then turned to my bride, and told her she was the most amazing person that I had ever met. "You see, I've been praying for you all my life," I said with a choked up voice as I reached under my seat to grab a container of so many emotions. "I've spent the last ten years writing love letters to you, praying for that amazing woman that God has for me. And now, I don't have to write letters to an anonymous person anymore. I have a name, I know who she is now, and I thank God for her every day." And I got the reaction I dreamed of for so many years. Beyond words, beyond appreciation, tears. I worked so hard for so many years, and to be able to give her that box as a completion of this prayerful journey was the greatest reward (other than the actual marriage) that weekend gave to me. I had no idea who this person was that I was writing to over the years. Hell, for all I knew, maybe there wouldn't be anyone to give that to. To finally cap those years of curiosity off on such a special occasion is something I'll never forget. Now when I pray for my wife, I truly do have a name to pray for. And I couldn't be more blessed. For any guy or girl who is still single, I highly encourage you to start a box like this. Sure it's a little bit of work, but the payoff is big. Being able to tell your spouse that you've been praying for them for so many years is rewarding, and it will enrich both her life and yours as well. Nothing shows you care like prayer, and if your marriage means anything to you, you'll start praying for it now.